Atmel Start only support PWM functionality for ERR (Red), DATA (Yellow) and CONN (green) of AVR iot WG board. Here we will learn to configure TCA timer in split mode to enable PWM on mikroBUS header of this board. Atmel Start is very useful tool to configure and initialize all the peripherals but in AVR iot WG case it does not auto generate the PWM functions instead only generate initialization function for TCA0 in Split Mode. When TCA0 is used in Single Mode, it worked as 16-bit timer and can provide upto 3 wave outputs. These upto 3 possible wave out pins doesn't include the pwm labeled pin of mikroBUS header. In order to use the PWM pin of mikroBUS header of AVR iot WG we need to configure the TCA0 in Split Mode. In Split Mode we can get upto 6 wave outputs but only half of the timer bits for each output to manipulate the wave form. To make our life easier we will use easy_pwm library which contains all the necessary functions for easy TCA0 Split Mode configuration and pwm generation. 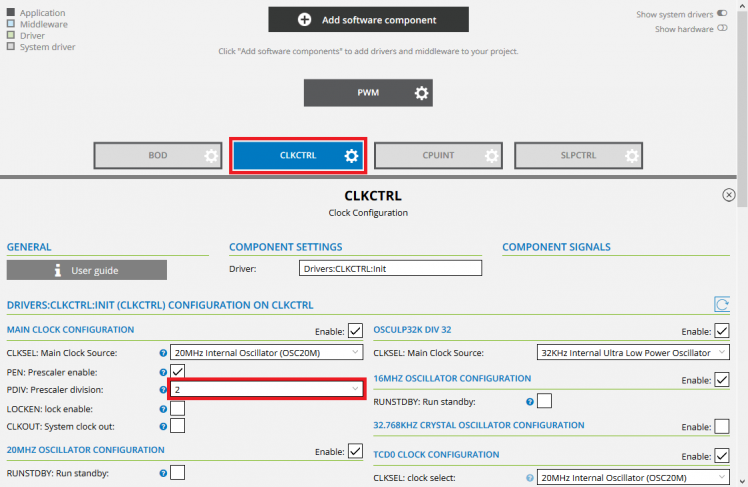 Goto "CLKCTRL" settings and change the "PDIV: Prescaler division" value to 2 under "Main Clock Configuration" as shown below. Now download the project without adding any software component. Also download the easy_pwm library from HERE. 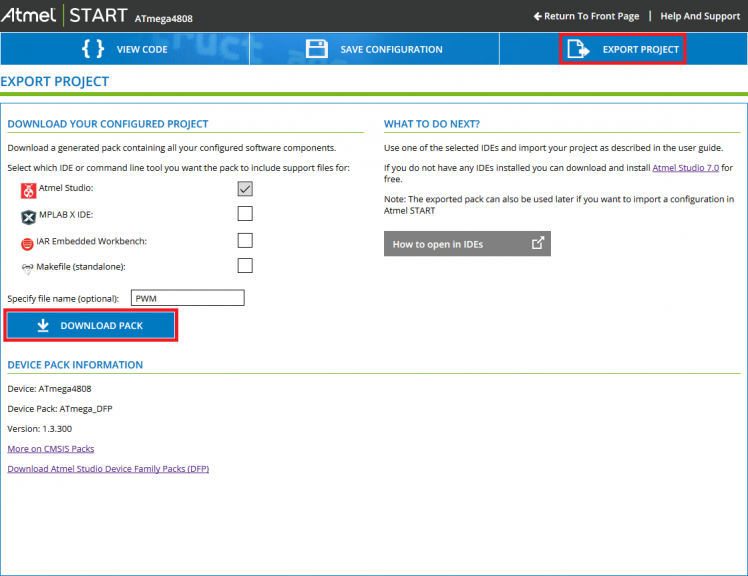 Open the downloaded Atmel Start project in ATMEL STUDIO 7 and add the easyPWM library folder in PWM project directory. 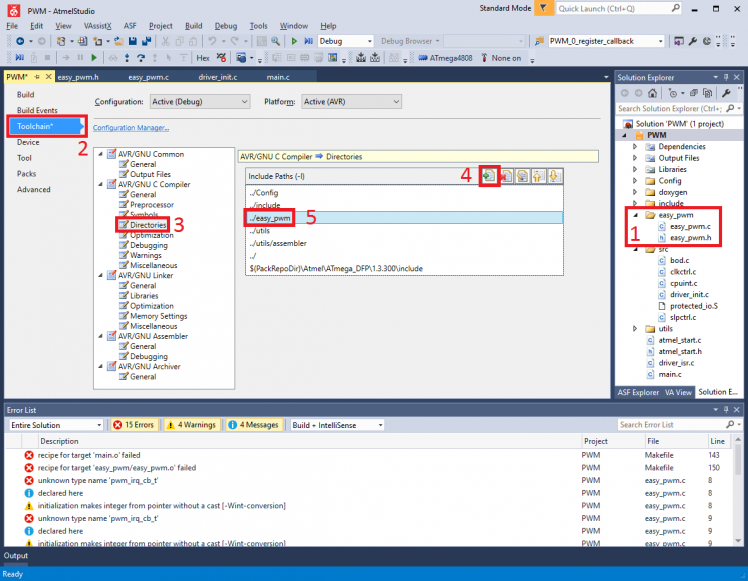 After adding the library in to our project we can see the source and header files of easy_pwm in "solution explorer". Now add the location of library files in C compiler settings for this projects by following the steps shown in image below. After including easy pwm library and initializing the AVR in main function, we will configure the PD4 IO pin as pwm out. When IO pin is set as pwm out, we can initialize and enable the TCA0 in Split Mode. And set 50% duty cycle to generate square wave. Now we can build and load on to AVR iot WG to test the pwm out by connecting the LED at pwm (PD4) pin of mikroBUS header. For easy pwm testing, we can change the duty cycle in while loop. LED with series resistor of 1K is connected at PWM (PD4) pin of mikroBUS header and PWM is used to controlled the brightness of LED. Changing the brightness of 1 Watt LED using pwm. 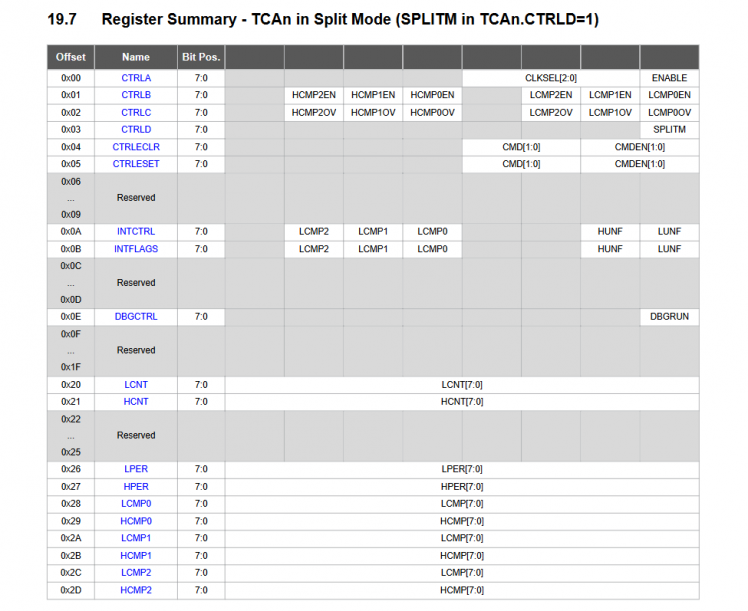 List of all the register used in easyPWM library for Split Mode configuration and operation of TCA0. Atmel START support only SPLIT mode initialization of TCA. And this easy to use PWM library provide all the necessary functions for easy configuration and enabling the PWM at PWM pin of mikroBUS header of AVR iot WG and upto 5 other IO pins.